Always in sync with your news, on all your devices. 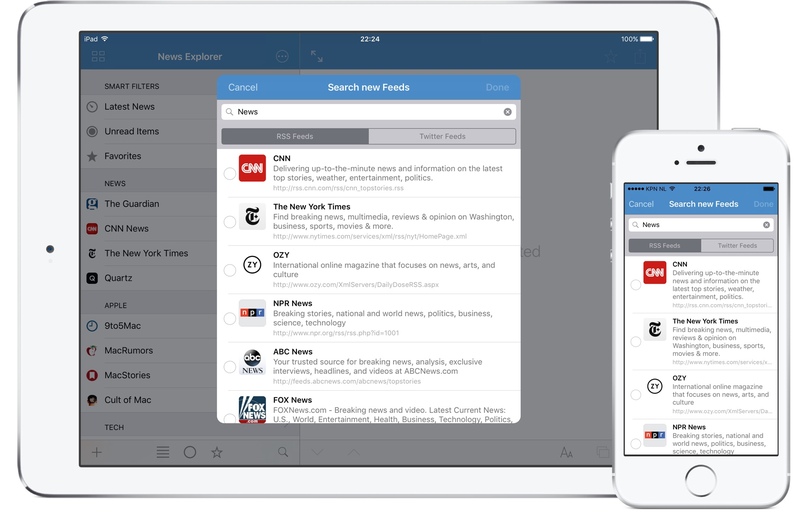 News Explorer is exclusively built for the Apple’s ecosystem, with automatic iCloud based synchronization of your feed subscriptions and news articles across all your Apple devices. Easy and fast news reading is the core business of News Explorer. Every step and element of the news reading workflow has been tuned to keep you on track with your news with minimal efforts. Expanding your news universe has been made really easy. New feeds can be added directly from your browser, or by clicking on a RSS URL, or by simply using the powerful built-in search feature. News Explorer syncs your RSS, JSON, Atom and Twitter feed subscriptions, folder setup, news items, read statuses and favorites across all your Apple devices. You'll always see exactly the same data on all your devices, be it an iPhone, iPad, iPod touch, Mac, Apple Watch or an Apple TV. Synchronization is based on iCloud. So there is no need to login or to sign up into any other service. It just works out of the box. Read, mark, share. And save some for later. Articles are automatically set to read after a configurable number of seconds, but you can of course also manually set items to read or unread. You can also set all items in a feed or smart filter to read with one click, including a configurable confirmation. All news items and included images can be easily shared by email, Facebook, Twitter, and so on, by using the system based share feature. On top of that, there is built-in support to share items with Instapaper and Pocket. In macOS, you can even assign a shortcut key to each sharing service. News items can also be stored for later reading by marking them as favorite. Reader view. Gives you the complete story. With Reader view you can download with one click the entire original news article from the web, and read it in a clean and easy-to-read format, within the same article view panel. This is especially useful for RSS, JSON and Atom feeds that only gives you a very brief summary of the complete article. 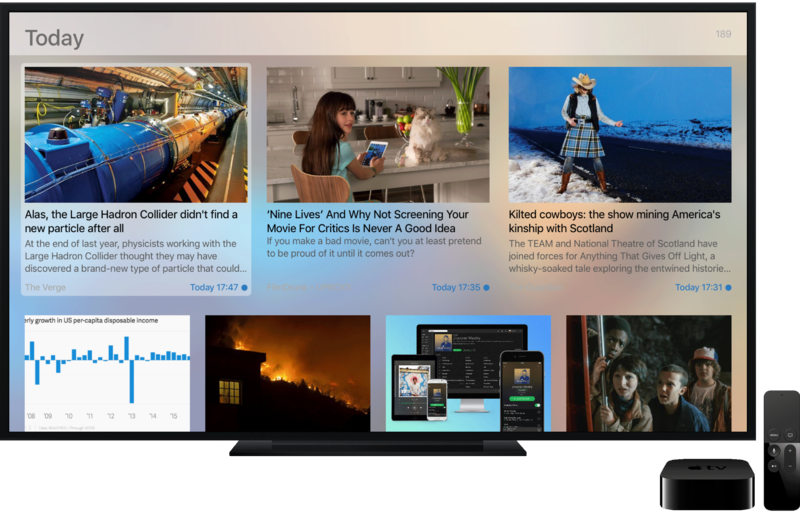 Reader view is also supported on Apple TV, which is very useful due to the missing web browser in tvOS. Filter, search and find. Instantly. The feed subscription list contains some handy smart filters for showing all recent news, unread news and favorites. Furthermore, you can apply global filters to filter all feed subscriptions and news items on unread status or favorite status (macOS and iOS). If you are searching for a particular news item, then you can make use of the full text search feature. This feature works together with the smart and global filters. A real multitalent. Get your news from everywhere. News Explorer supports not only RSS, RDF, JSON and Atom feeds, but also Twitter news feeds. With Twitter news feed support you can subscribe to Twitter user account timelines and to Twitter hashtag feeds. Twitter feeds features pixel perfect rendered Tweets on all platforms, including retweets, replies and correct handling of images and embedded video. And on macOS and iOS you can even reply, retweet and like Tweets without leaving the app. Take a new perspective on your news. The timeline view shows multiple feeds with their stories including large images and text previews, all-in one attractive view, sorted in chronological order. This makes it really easy and fun to find the news articles you're actually interested in for further reading. Themes and fonts. Adjustable to your mood and taste. The appearance of News Explorer can be adjusted by selecting one of the three carefully created themes. The iOS edition has an additional special 'Black' theme optimised for the iPhone X OLED display, but also perfectly useable on other iOS devices. The font style and size used in the article viewer in the macOS and iOS edition of News Explorer is also fully adjustable. The iOS version goes even one step further by supporting Dynamic Type, which let you adjust the font size of the article list and the Timeline view. News Explorer is constantly being updated, to support the latest Apple inventions and devices, like Retina displays, Handoff, Force Touch, Dynamic Type, Apple Watch and Apple TV. The latest version of News Explorer adds full Touch Bar support for the new MacBook Pro's. News Explorer makes it easy to add new RSS, JSON and Twitter feeds. 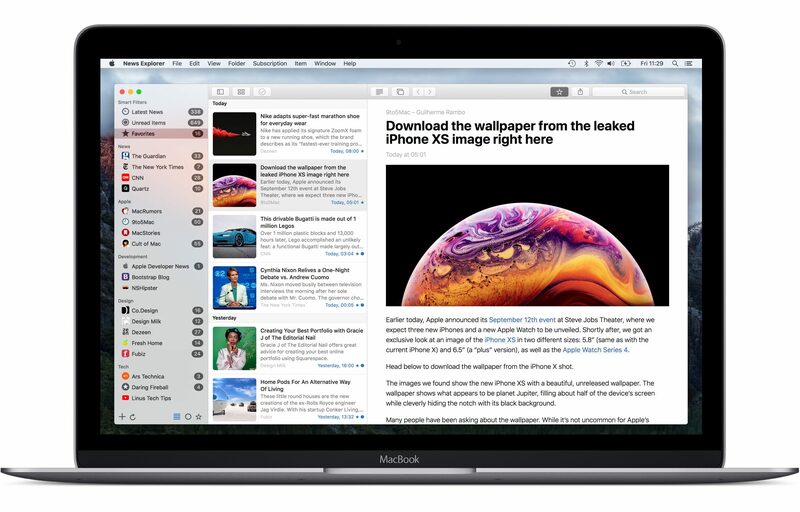 The ‘Add to News Explorer’ sharing extension allows you to add feeds to News Explorer directly from the sharing menu of Safari and other browsers. But you can also add feeds manually in News Explorer by entering a feed or website URL with RSS or Twitter autodiscovery, or by clicking on a RSS feed link in a web page or other source. However, the fastest way to discover new feeds is by using the built-in search feature. Just enter a search phrase and you'll see a list of matching feeds, including a brief description of each RSS or Twitter feed. Coming from a longtime NetNewsWire user and because I don't share the philosophy behind all these paid rss services, plus the fact that iCloud is well capable of handling the syncing, I must say that this app is actually impressive, it deserves an Apple Editor's Choice for its simplicity, its features and the well implemented syncing with iCloud. This one gets 5 stars from me. This developer rocks! This is a fantastic app for news aggregation. I have been searching for a good one for a while now and stumbled upon News Explorer on my Mac App Store. I love the iPhone app, iPad app and the desktop app. It works seamlessly. I really appreciate the feed search and the interface simplicity. Excellent work! 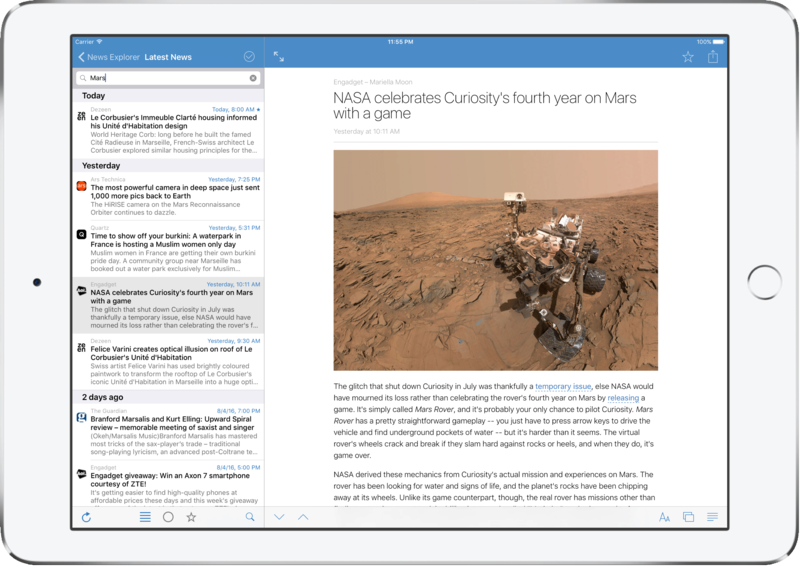 I don’t write many reviews, but feel compelled to offer some feedback about News Explorer. I maintain a list of several hundred feeds and depend on a reader that can handle a large number of subscriptions with a high level of performance in terms of synchronization and article rendering. I also place a high priority on a reader that is intuitive, unobtrusive and has a modern look and feel. I’ve used all of the available RSS clients and, personally, find that New Explorer absolutely destroys the competition. Having used a range of readers that wound up having at least one or two showstopping limitations that left me wishing for a better option, News Explorer has far exceeded all of my expectations. My previous go to reader was Leaf and this reader is light-years ahead. The $10 price is non-trivial, but you will not be disappointed if you are looking for the best reader (in my opinion) currently available. I follow roughly a 100 news sites and blogs. I have used a number of different RSS aggregators (there are several great ones out there) but I have just moved over to New Explorer. It is working quite well. There was a small problem that emerged during the first hour or so I used it. I contacted the developer and he immediately solved my problem. I really like the sync function via iCloud; I am running the iOS version on my iPhone and iPad, and the syncing via iCloud has worked without a hitch. The search function is lightning fast. All around effective news reader and great support. A powerful combination. This app is great! The syncing works very well. Not only does it allow you to check and mark your RSS feeds on your Apple Watch, you can also read the full text version of the story on your Apple TV later if you download it first on your iPhone. News Explorer is a fantastic way to read and get news. (...) It offers a distraction-free interface with a built-in browser and a selection of themes for customization purposes. Offline news is supported, as are smart filters, reader view, built-in imaging viewing, and more. Por lo demás creo que es una aplicación muy a tener en cuenta para aquellos que no quieran depender de un servicio externo de sincronización y que se sientan cómodos con el diseño nativo Mac. (...) Sin duda es la novedad más importante y seria que hemos tenido en cuanto a lectores de feeds nativos para Mac e iOS en unos cuantos años. The app works particularly well for those of us who are inveterate news junkies. (...) Still, there’s just no better way to keep informed these days than an RSS reader and News Explorer is a favorite. Betamagic’s News Explorer brings the latest news from your RSS feeds right to your desktop. (...) News Explorer’s main window sports a fully-customizable layout, and synchronizes all your activities across your devices via iCloud. Keep your news sources in the same place and manage them with ease. Within the News Explorer main window, you can easily add new subscriptions by providing the RSS link, or you can rely on the app’s search subscription function.The latter option is great of you don’t want to search for the links on your own: just provide a keyword, and the app will go online and display all available feeds. It’s called News Explorer and it might be the most perfectly simple RSS reader available for Mac, iPhone, iPad, and Watch. Yep. That’s right. RSS subscriptions sync up automatically between each Apple device– OS X, iOS, and Watch– to deliver up-to-the-minute news headlines, complete with a summary, and a single click gets you the whole shebang. News Explorer is available on all Apple platforms. All editions offer the same core features, including iCloud synchronisation. Not all features are supported on all platforms. This table gives some more insight what to expect for each edition. The macOS version of News Explorer will run on all your Macs with OS X 10.12.2 Sierra or later. Also available on the Mac App Store. The App Store version of News Explorer will run on all your iOS 10.3 devices, plus Apple Watch and Apple TV. © 2019 Betamagic. All rights reserved.